The Justinian Society News: The Passing of Judge Charles P. Mirarchi, Jr. 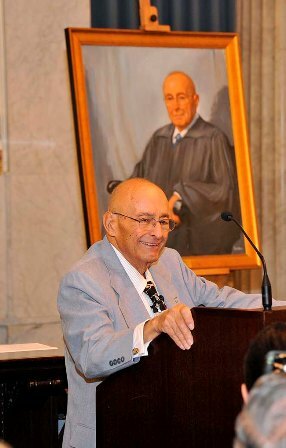 The Passing of Judge Charles P. Mirarchi, Jr. It is with great sadness that we inform our members of the passing of Judge Charles P. Mirarchi, Jr. who passed away on May 11, 2010. Members of The Justinian Society of Philadelphia today spoke of their many years of abiding affection for Judge Mirarchi. We remembered a trailblazing member of our community who opened the door for so many others, a man who achieved great heights but never forgot his humble beginnings. On a personal note Furia Rubel spoke of her family’s long association with the Judge. Furia Rubel’s father and past Justinian Chancellor, Richard F. Furia said, “Judge Mirarchi was a wonderful friend, neighbor, and member of the legal community for as long as I can remember. He was always a model member of the bench and bar. A patient, respectful and honest judge, he and his kind words will be greatly missed by so many." Furia noted that all three members of Judge Mirarchi’s old law firm: Mirarchi, Coppolino and DeFino became judges of the Court of Common Pleas in Philadelphia – all were from South Philadelphia and all were Philadelphia Justinians. William P. Fedullo said he still thinks of Judge Mirarchi “as the standard by which I rate all judges.” Fedullo, a past Justinian Chancellor who clerked for the Judge said “Judge Mirarchi’s wise counsel then and throughout the years sustained me.” Fedullo remembered the Judge’s selfless work for Delaware Law School of Widener University (now Widener University School of Law) and the Judge’s many charitable endeavors. “He created opportunities and careers for so many people. He was so kind and generous. We all loved this man,” Fedullo added. There will be a viewing for Judge Mirarchi at Monti-Rago Funeral Home (http://www.montifuneralhome.com/FuneralHome/) Friday, May 14, 2010 from 7:00 to 9:00 p.m. and Saturday morning, May 15, 2010 from 8:30 – 9:30 a.m. A Mass of Christian Burial will follow at 10:00 a.m. at Annunciation Church, 1511 S. 10th Street, Philadelphia.